The following describes how to install WordPress from your DreamHost panel. It also details the extras features you receive if you choose the free 'Deluxe' install. The problem was directory /home/username/example.com is not empty! This is only an issue if you've uploaded files to the site in the past. If this is a new site you just added to your DreamHost panel, you can skip this step. Next, make sure the FTP client is set up to view hidden files. Log in and click into your website's directory. It's most likely named the same thing as your website. The directory should be completely empty. If you notice any files, back them up or move them to another directory. Only when your site's directory is empty can you proceed with installing WordPress. 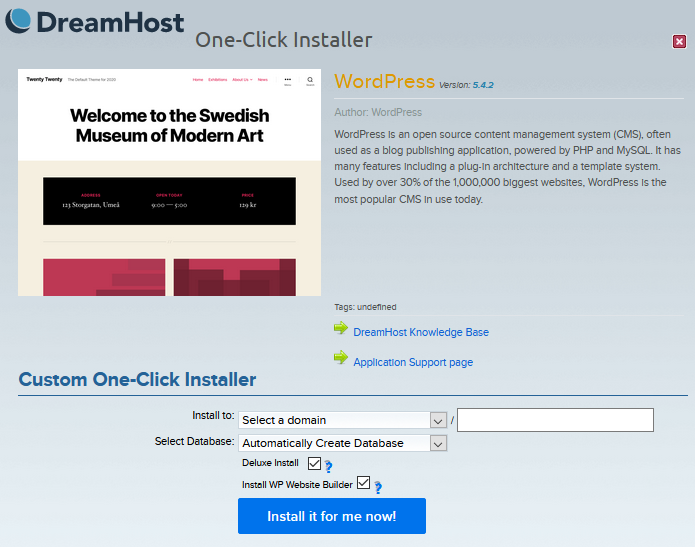 To install WordPress at DreamHost, log into your panel and go to the One-Click Installs page at One-Click Installs. From the list of One-Click-Installs, select 'WordPress'. Install to: Select the domain you'd like to install into. The second textbox is if you want to install into a subdirectory (if you do not want it stored in the primary directory). For example, if you want it installed into example.com/blog first select example.com in the first dropdown menu. In the second textbox type in blog. Select Database: You probably want 'Automatically Create Database' since this creates a new unique database for your site. You can also choose an existing database if you like. Deluxe Install: It's recommended you check this box if you would like the extra features mentioned below. This is a free addition to your install. Click the Install it for me now! button. Within 15 minutes, an email is sent to you at the primary email listed on your DreamHost account. This email details further steps to take to complete the installation. After you've installed WordPress, you'll receive an email to the primary email address on your DreamHost account. This email lists further steps to take to complete the installation. The free Deluxe Install features several important customizations to make it easy for beginners to get started, including free and open source themes from Automattic, a standard selection of plugins, and a security enhancement. Though these plugins are installed by default for Deluxe installations, you may need activate them in your WordPress dashboard by going to ‘Plugins' > 'Installed Plugins’. Additionally, the One-Click Deluxe Install adds protection against the execution of scripts within your uploads directory. If your site is compromised through the placing of a malicious script in your uploads directory, the script is returned as a download when accessed. This keeps the script from running and helps to prevent further damage. DreamHost will continue to add additional security enhancements as they become available.